You may or may not be familiar with this story. Even if you are, it bears repeating. 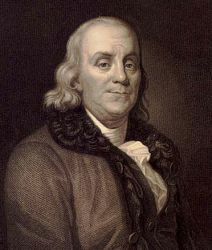 Benjamin Franklin developed a system for living his core values as a young man. He sought moral perfection. He developed a list of thirteen virtues he wanted to follow. We’ll talk about his thirteen virtues in a minute. What was more revolutionary (we couldn’t resist!) was how he made sure he lived his core values. He developed a chart [PDF] with the days of the week at the top and the virtues listed in the in the first column. Then he tracked his progress daily! He learned, from experience, that he couldn’t possibly change thirteen things at once. So each week, he focused on one. After thirteen weeks, he’d covered them all. Then, he realized what a difference living these virtues had made in his life. So he repeated the process. He continued this for the rest of his life. Make no expense but to do good to others or yourself; i. e., waste nothing. Rarely use venery but for health or offspring, never to dulness, weakness, or the injury of your own or another’s peace or reputation. Whether you use Ben’s virtues or make up your own goals, he developed a great system for making it much more likely that you get, rather than just set, your goals!